AUSTRALIAN live sheep exporters will next year impose a three-month moratorium on Middle East shipments during the Northern Hemisphere summer. The Australian Livestock Exporters’ Council said the exporters wrote to Western Australian sheep producers today, advising them of the new three-month moratorium. ALEC independent chairman Simon Crean said the moratorium would provide certainty to sheep producers who supply the trade and is just one initiative among wider ranging industry reforms. 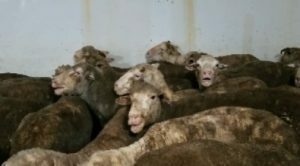 The self-imposed moratorium decision follows significant community and political pressure to end Middle East sheep shipments during the Northern Summer as a prelude to a general phasing out of long-haul shipments. Several bills are currently before Federal Parliament to phase out the trade. Some exporters have also questioned the viability of such Middle East Northern Summer shipments under new heat stress and loading density rules. Recent government review and restrictions on the trade were initiated after video footage of Middle East voyages experiencing heavy losses due to heat stress was released by animal rights body Animals Australia. The moratorium will take effect from 1 June 2019, and will mean no shipments of Australian sheep will depart any Australian port for the Middle East during the highest heat stress risk period of the northern summer. At this stage the moratorium is intended to apply only to sheep. Live sheep under heat stress during a Middle East shipment last year. An ALEC statement today said exporters will observe the moratorium while the industry develops new technology which could, in the future, address the heat risk challenges associated with shipments in June, July and August. In addition to the moratorium, sheep exporters have agreed to initiate a program of transparency and on-board monitoring, to be designed and developed by LiveCorp. The program will improve transparency and communication with producers with regard to on-board conditions and the performance of shipments, ALEC said. ALEC said in the seven years from January 2010 to December 2017, Australia’s live sheep exports to the Middle East contributed $2.06 billion to the Australian economy, exporting 16.6 million sheep over 258 voyages. Mr Crean said exporters know that participating collectively through ALEC in industry governance and reform builds consensus and promotes accountability. Mr Crean said it is also important to note these reforms alongside ALEC’s ongoing commitment to implement the Livestock Global Assurance Program (LGAP) which will improve animal welfare, and control and traceability within the livestock export supply chain. ALEC said LGAP is the outcome of many years of industry research and will be governed by an independent board. The purpose-built program aims to provide animal welfare outcomes that are equivalent to, or improve upon, those provided by the Federal Government’s Exporter Supply Chain Assurance System (ESCAS). LGAP seeks to drive greater efficiencies and effectiveness in delivering those outcomes by extending accountability to the facilities in the supply chain, so that the in-market feedlots or abattoirs that actually own the livestock share the responsibility for ensuring their welfare, ALEC said. “Our newly appointed chief executive officer Brett Pointing brings exceptional skills and experience in driving cultural change. “He knows generational succession is key in any cultural change and the new ALEC board reflects that,” he said.